What seems to have taken over the C7 Corvette mid-engine rumors that just wouldn’t quit is the new possibility of the upcoming rear-wheel-drive Chevrolet sport sedan, which could be called SS according to trademark filings we discovered, is the possibility of a pair of variants. And if you ask us, they’re incredibly tantalizing. You just have to go with what Car & Driver is reporting. 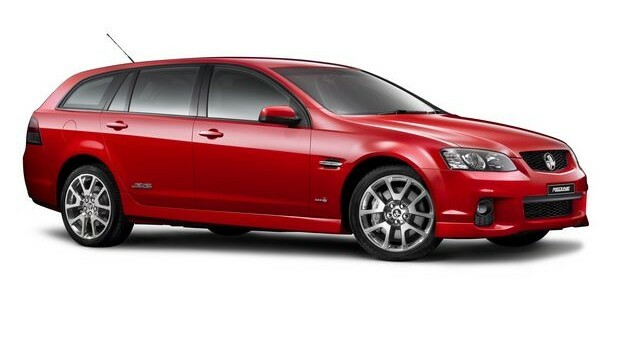 One rumored variant of the SuperSport is said to be a ute — or an Americanized version of the Holden Commodore Ute. Essentially, it would be the rebirth of the Chevrolet El Camino with the chassis of a sports car and the versatility of a pickup truck. Second would be a full-on wagon version of the sedan, which we like to think as a middle-class CTS/CTS-V Wagon. These two vehicles could easily be the greatest contributions to society from Australia, along with boomerangs and the black-box flight recorder. And definitely more significant than Fosters. Yuck. -offer bench seating, at least in the regular version to make it a three seater. Here here! From one Chris to another… I’m going to have to change my post name now! No, because that would start to step on the Silverado’s toes. Hell no! It would cost too much engineering dollars to redesign the Zeta’s cabin to allow for benchseats when it already comes with buckets. Maybe with Zeta mk2, but not now. Give me an ute with a manual trans and I’m in. Price it under $30k and show me where to sign. Judging from other recent stories about Holden’s inability to build enough vehicles, any civilian versions will have to wait for a US production line to start up. All wheel drive needs to be an option on all the versions that get sold here. Zeta was designed to support it so it shouldn’t be that big a deal to add it. It’s gonna add a little weight and lower the fuel economy a bit, but I bet Chevy would sell a ton of awds in the northern areas of the U.S. Also, both the 300 and Charger offer it as well as the Taurus which are the cars this new SS will be compared to most. Competitive means offering all the things a competitor can offer, also. Holden DID sell a 4 door AWD Ute called the Avalanche from 2003 to 2005. I have been longing for a real wagon for years. The sport wagons out there right now just do not have the visibility or storage to really pack stuff in the way I did will my Accord wagon of long ago. I need to be able to transport a lot of stuff and the wagons out there right now just don’t have that ability. So, I had to buck up and get a SUV so I could tow a small trailer. In hind sight, I should have bought a straight up truck so I could tow one of my cars too. well i hate to rain on your parade, but i guarantee that the VF wagon will be as versatile as the Dodge Magnum at best, and as small in the rear as the CTS wagon at worse. Modern wagons are little more than slightly practical design exercises. when Chrysler killed of the Magnum, the best real wagon i could settle on was the Ford Flex. that said, i hope they do bring the Wagon and UTE over. the more choices the better. besides, the wife still wants a SRT8 Magnum, maybe i can convince here to go with a V8 SS wagon when she finally lets go of her Dream Cruiser. Hey – again a lot of buzz `bout something that likely won`t happen. I think an UTE is a hard sell for the American market, not a good idea to bring to production – don’t see them getting their money back on that. What’s the closest thing to an UTE we’ve seen recently, the SSR or Subaru Baja? Maybe if there was already an UTE segment then they could compete in it sure but I don’t think many people will want to go that far out on a limb with a car purchase. However a wagon is badly needed, and if they’re worried about biting into Equinox sales then make the Equinox bigger or bring back the Trailblazer, there is room in the lineup to shift sizes around and fill it out better. Could you imagine a Pontiac G8 GT wagon??? Just slap a bowtie on it! AWD has to be available on any wagon in US, Outback, Volvo, and Audi wagons are all predominantly AWD. CTS wagon shouldn’t be the only sled GM offers, and a Chevy wagon should have more room and decent visibility unlike the dreadful rear visibility of the Dodge Magnum and not much better CTS wagon. Wagon and turbo 4 with 6-speed manual. Would that be too much to ask? Probably. Step on the toes of the silverado, [email protected] are you talking about; the UTE is a completely different vehicle. No one is going to cross shop a Silverado and a Ute; as a fellow GMA poster and friend let me recommend you get your head examined. Someone who wants a truck is going to cross shop an f150 and a Ram and a silverado, someone who is looking for a utility driven vehicle is going to consider a Ute along with an SUV. I appreciate your concern for my mental health, Mr. Flintstone. But when the Silverado starts at $22K USD, I have a hard time seeing what the Ute can do at a price lower than what a base Silverado can do. I know they’re two different vehicles, but they are both pickups and thus share the same market and would likely have the same buyer. Even the lowly Colorado would have problems with overlap. With it’s forthcoming replacement, it presently starts at $17.5K USD, and I don’t think the Ute can make it to North America for less than that. I agree completely, I want to sell my truck to buy a Ute. To me new trucks are nice, but just to big for my needs. I carry stuff for my business so need a truck type vehicle. Besides I’m in the high performance business, image is everything. A modern El Camino would be perfect! I would buy a modern el camino, I really want a truck but I don’t think I can justify it as a daily driver with the current economy, but if this came out I would definitely buy one! the four door ute (crewman) has only token rear seats at best and only lasted from VY to VZ, the cops were very happy to replace them with the VE ute for their divvy van, the last thing they wanted was to have somone in the back seat with them. this is why we don’t use the caprice as a cop car, you give cops here any grief and your going in the back, and around half the police fleet are divvy vans. Isn’t this a revival of the rumors we had back in 2008? Before our hopes were crush by the recession and Bob Lutz? Here am I having to put up with wifey’s desire for a wagon…….and this comes along tantalizingly just out of reach….. If anything helps with this, I was just looking at the only thing that both the Ute and the Silverado have in common; the bed. Maybe it’s my understanding of the truck market in North America, but there seems to be a clear distinction between things that make a car a car and a truck a truck; as far as they may share some of these defining features, but not in full. A Silverado with a plush cabin, or a modified Commodore with a bed. To me, they are different, but the overlap they share is too much for Chevy’s range. In Ute’s defense, I can’t speak of it’s abilites as a truck, and it’s very likely it could do the work of a truck used by a tradesman. Off-roading, not so much. But if you really want to think I’m crazy, I think of cars as feminine and trucks as masculine. Thus, the Ute is a hermaphrodite. An AWD wagon version would be excellent, but I am not holding my breath that GM will ever actually sell them in the US. As for the Ute… it’s a cool concept. If fuel prices stay high it could be an alternative to a small pickup truck, although it would not be for everyone. @ G DADDY IF CARS ARE FEMININE MAYBE SS SHOULD BE CHANGED INTO XY.